Tap tae bottom, left tae richt: The Xscape an Theatre seen frae Campbell Pairk, umwhile railway wirks an new hoosin in Wolverton, Milton Keynes Central railway station, the Central Milton Keynes skyline, The Kirk o Christ the Cornerstane an Bletchley's heich street "Queensway". 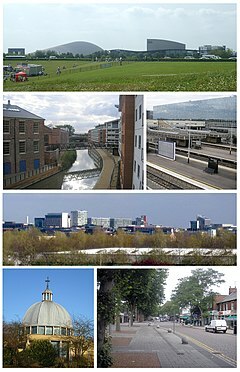 Milton Keynes, locally abbrevitit tae MK, is a lairge toun[note 1] in Buckinghamshire, Ingland. 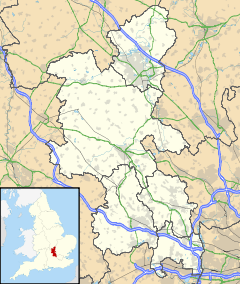 ↑ Althou Milton Keynes wis specified tae be a ceety in scale an the term "ceety" is uised locally (inter alia tae avoid confusion wi its constituent touns), formally this teetle canna be uised. This is acause conferment o ceety status in the Unitit Kinrick is a Ryal prerogative. ↑ "2011 Census - Built-up areas". ONS. Retrieved 1 July 2013. This page wis last eeditit on 19 Juin 2017, at 23:55.